To look forward to the end of the next decade, this report considers demographic challenges, the strength of the supply chain and emerging policy disrupters. Its findings are based on data specifically commissioned by HEPI from the Higher Education Statistics Agency (HESA) and the Universities and Colleges Admissions Service (UCAS), as well as data already in the public domain. 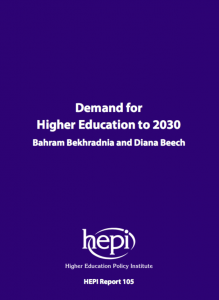 This report projects demand for higher education in England until 2030. Produced seven years after the last HEPI assessment of demand for English higher education, it reviews how things stand today, in a very different policy environment, marked by increased tuition fees, the removal of student number caps and the prospect of Brexit. ← Differential tuition fees: Horses for courses?